Ramadan is nearly upon us In sha Allah, and for those of us who are parents, the month brings with it a desire to imbibe a love and excitement in our children for fasting and the unique ibadah that comes with this month. 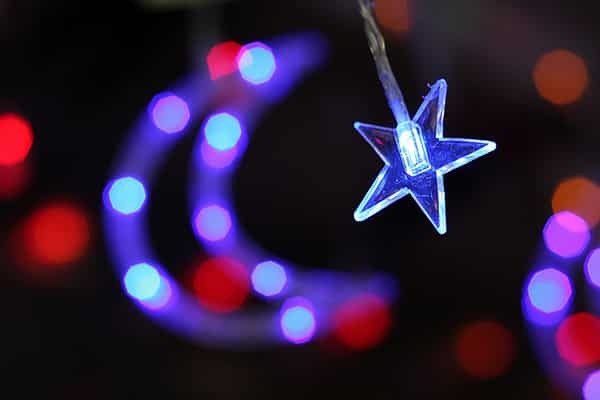 In this article, I share my tips and advice on how to prepare your children for Ramadan. Unlike Muslim countries, where markets, streets, television and the general population all foster a sense of connection to Ramadan, parents who live in non-Muslim countries have the added challenge that there is little recognition of this holy time outside of our homes and mosques. Muslim parents have complained to me about how hard it is when Christmas is a massive and exciting public event, while Ramadan and Eid pass by mostly unnoticed. Christmas, with its beautiful decorations, magical themes and catchy tunes blaring over loud speakers in every mall for weeks on end, can make Ramadan and Eid look dull in comparison to children. Whilst I don’t believe we should view it as a competition, as parents I firmly believe we have a responsibility to make all religious obligations meaningful and, as much as possible, enjoyable for our children. I say this as someone who has limited craft skills: I can’t use a sewing machine, I do not own a hot glue gun, and there is no such thing as a “craft cupboard” at my house. I’m also busy like so many of you with work and volunteering and the demands of family. You simply need an enthusiastic mind and a heart that desires iman for your child. The following ideas are things I came up with over the years for both my own children and for the children at my Saturday madrasah. They are very basic, and generally you can get the kids to do it themselves. They are also often designed for the whole family to be involved, as it is in doing so that memories are made, family traditions are started, lessons are taught, and faith is sewn. Decorations remind everyone who enters the home that this is a special time. I found that there were some decorations I simply could not stand to look at for 30 straight days (slowly deflating balloons in particular), so I chose something I could enjoy for a whole month. I purchased a range of colourful Chinese paper lanterns from my local discount store and strung them up in my living room. They were cheap, looked great, and were not the kind of decorations my kids automatically associated with other celebrations (i.e. tinsel for Christmas or balloons and streamers for birthdays). I also cover windows with Ramadan messages and drawings made with coloured window chalk, and we have a special scented candle we light every night at Maghrib in Ramadan that changes colour every few minutes. You know best what decorations will make your family happy, so go for it! 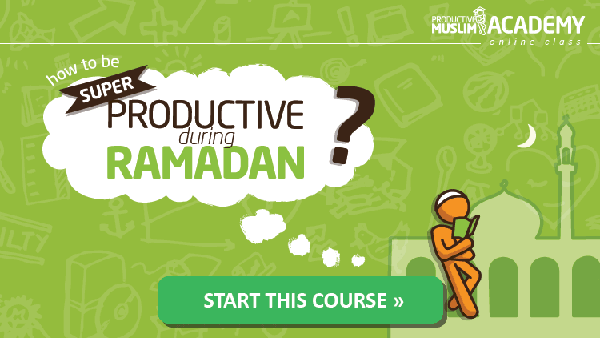 Get everyone to help you decorate a day or two before the month starts, while blasting Ramadan anasheed. Marking off the days of Ramadan is a lot of fun for kids. 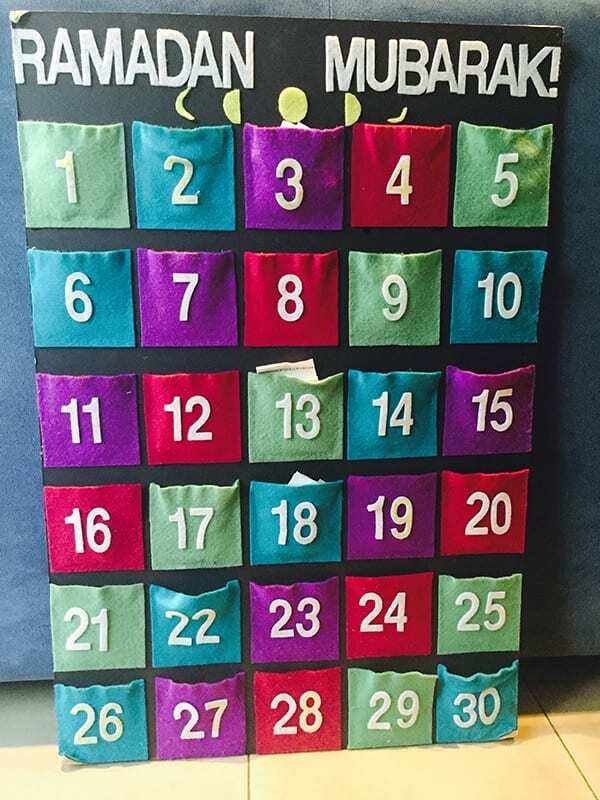 The simple calendar I made for my children (felt pieces glued on to a black board) has little pockets, where I put a note with either a sweet or a date for the kids. The notes have changed over the years based on the age and knowledge of my children. When they were very small, the notes just said things like “Allah loves you so much!” and “In Ramadan, adult Muslims don’t eat or drink anything from before sunrise until sunset!”. As they grew older, I put in more advanced lessons or Qur’an verses. If we have guests, I ensure there are enough sweets or dates in the pocket for every child who visits. The children are not allowed to get the note or sweet until Maghrib time, as this helped create a sense of excitement for this time of day, even when they were too young to be fasting. If you’re not keen on making your own calendar, you can buy beautiful handmade silk and wool calendars or even just print these great ones for free, and cross off the days as you go. We all need a plan for Ramadan, otherwise it’s easy for the month to whiz by without much change in us other than increasing bad breath. Kids should be encouraged to have goals, too! 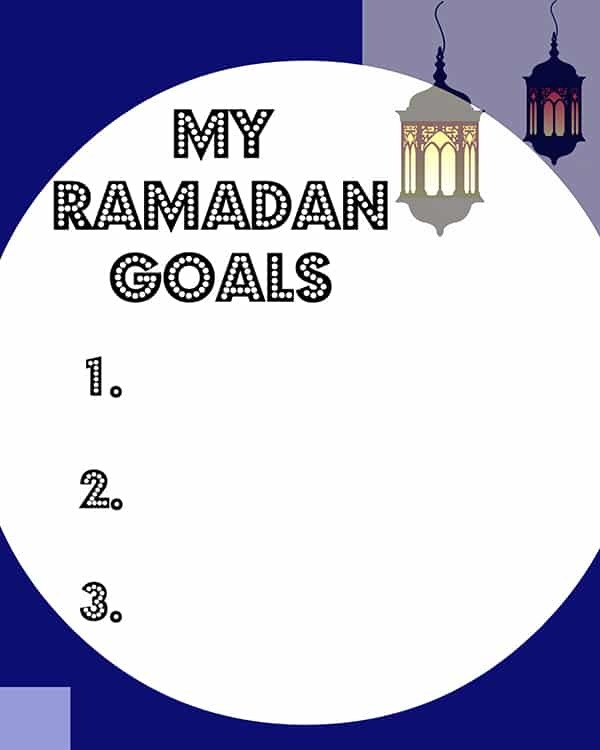 As parents, it’s important that we explain to kids why Ramadan goals matter, and the importance and reward of extra ibadah in this month. On the other hand, teenagers can benefit from a Ramadan diary: buy them a funky notebook or get a plain one and allow them to decorate it themselves. Tell them it’s for them to record not just their goals at the start, but their feelings, thoughts and prayers to Allah as the month continues. I do check them to see that they are writing in them regularly, but I never read specifics (I generally only flick through the pages), as privacy is important at this age. Keep any goals the kids have close to where your family eats or prays, and be sure parents and any elders who live at home have somewhere to write their goals too. Remind and encourage each other as the month progresses, and be sure to warmly praise children as they achieve or maintain Ramadan goals. Teaching your children about sadaqah during Ramadan is one of the best ways to implement this trait in them from an early age, as they learn the importance of charity and the need to share with those who have less than they do. Giving in charity does not just have to be raising money for charities, but can be as simple and sincere as sharing iftar food with your neighbours. This has the added benefit of your children actively participating in da’wah and teaching others about Islam. Kids often want to share about Ramadan with their non-Muslim teachers, neighbours, friends or family members but don’t know how. We make cookies each year (or to make it even easier, you can buy plain round sweet cookies and decorate them with icing and sweets), put them in clear little bags and attach a little note about Ramadan with string or ribbon (be sure to list ingredients on the back of the note in case of allergies). Then we deliver them with a smile! If your children attend a secular school, donating good quality books about Ramadan is a lovely way to ensure the correct image of and information about this time of year is available in the school to any teacher or child who may want to know more about Ramadan. School libraries are always grateful for donations of good books! Books such as “My First Ramadan” and “Rashad’s Ramadan and Eid al Fitr” are great for very little children. Books such as “Ramadan Moon”, “Under The Ramadan Moon”, and “A Party In Ramadan” are good for older children. Even if your children attend an Islamic school or are homeschooled, why not consider donating a good book about Ramadan to your local library for the benefit of everyone? I also leave a collection of nice Ramadan books out at home for my own kids to peruse throughout the month. Get a large box and have the kids decorate a sign for it that says “sadaqah box”. Throughout the month, encourage everyone in the family to put both money and food donations in the box. Do the kids have good quality toys they would be willing to part with to go to a charity shop? Praise kids when they add to the box, and ensure they see you putting things in the box too. As a family, decide where you will donate the money and food, and be sure to take it before Eid so the recipients can enjoy the donation on Eid. Crafts are a fantastic way for your children to get excited for Ramadan; it allows them to express their creativity, learn and get messy at the same time! Have a look at my ideas for different Ramadan crafts for your children and get the whole family involved. These can easily become a Ramadan tradition! 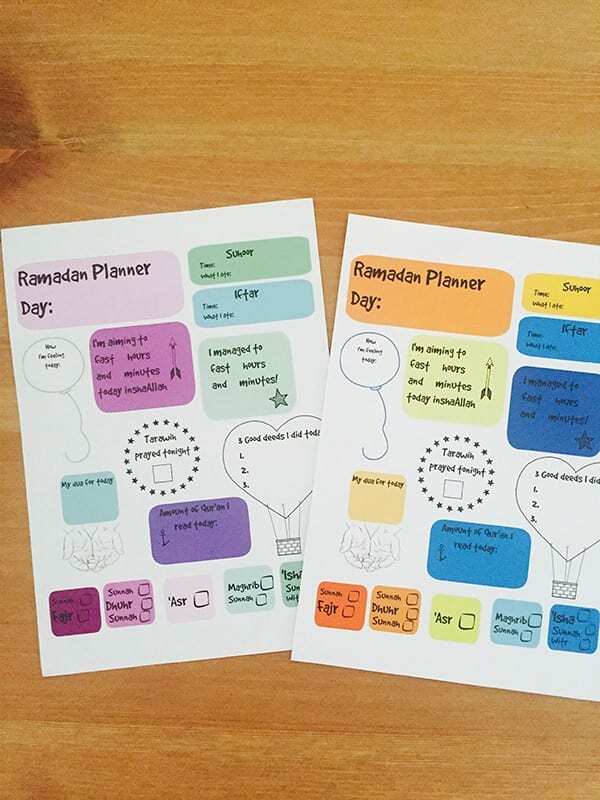 They are easy to make and a great way to help kids learn the iftar and suhoor dua. Print out the dua on A4 paper (we always do Arabic, Arabic transliteration and English), then let them decorate it to their hearts’ content. Laminate to seal everything and they will last for years (older children and teens love to see the cute pictures they drew on their Ramadan placemats all those years ago). If you do not have access to a laminator, you can use long pieces of sellotape to cover the decorated page entirely– a great and cheap alternative to lamination! Another idea is to make them from felt, with a little pocket on one side for cutlery, and another pocket on the other side to slip in dua cards. Kids can decorate them with coloured felt shapes, and the mats can be gently washed when they get dirty. We all want to do good deeds in Ramadan, but sometimes it can be hard to know what to do, especially for kids. Good deed activities are a great way to remind everyone about the need to keep aiming to do good deeds. It can be as simple as a bowl in the middle of the dining table with folded-up notes of good deed suggestions, or as fancy as a Good Deed Tree like this or this. 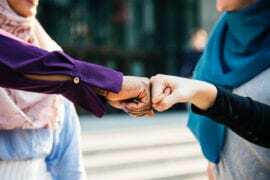 Gather as a family and write down a big collection of good deeds that everyone in the family can manage: learning a new portion of Qur’an, helping an elderly neighbour or family member, praying two extra raka’hs etc. Everyone in the family takes a good deed from the bowl each day and completes it, and chats about their experience over iftar; what they found fun or hard or interesting about doing it. Doing this will help children realise that their parents do good deeds regularly, because often as parents we forget the need to consciously model such behaviour for our kids. 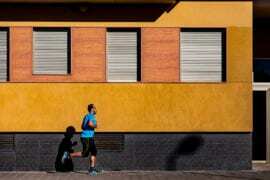 It also teaches them that struggling with doing good is both normal and acceptable, and allows parents to model how they deal with these situations without giving up. This is a lovely family activity to do in Ramadan that beautifully introduces young children to the idea of dhikr. Write “this Ramadan, we say Alhamdulillah for…” on the top of an A3-sized poster paper which is put up near to where the family gathers to eat or pray. Leave a stack of coloured sticky notes and markers next to the poster, so each person in the family can write at least one thing they are grateful for, every day of Ramadan. It can be as important as their life, family or faith, or as small and funny as chocolate, coffee, or tickles! Encourage visitors to contribute too. At the end of the month, your poster will be covered in sticky notes and your family will have not just a gorgeous record of gratitude to Allah , but a tangible proof of the abundant blessings in their life. This is a fun activity to do with kids after teaching them about the sunnah of breaking one’s fast with dates and the reward of helping someone else to break their fast. 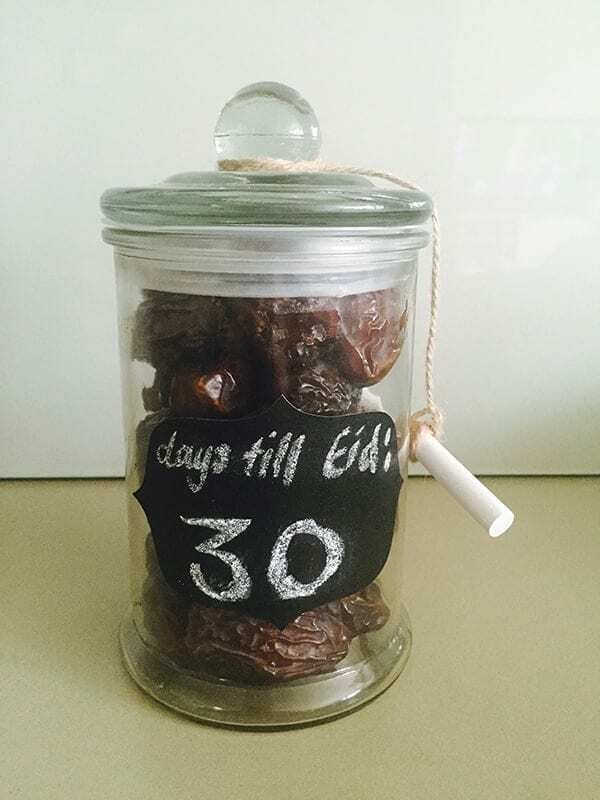 Have children count 30 dates into a jar, and then attach a chalkboard label and piece of chalk with string for the recipient to count down the days till Eid. If Ramadan is only 29 days this year, the recipient can use the remaining date to fulfil the sunnah of eating a date on Eid morning! Your children can create these jars to give to friends and family at the beginning of Ramadan. I wanted to introduce my children to the idea of i’tikaf in Ramadan while they were still small in a fun and special way. 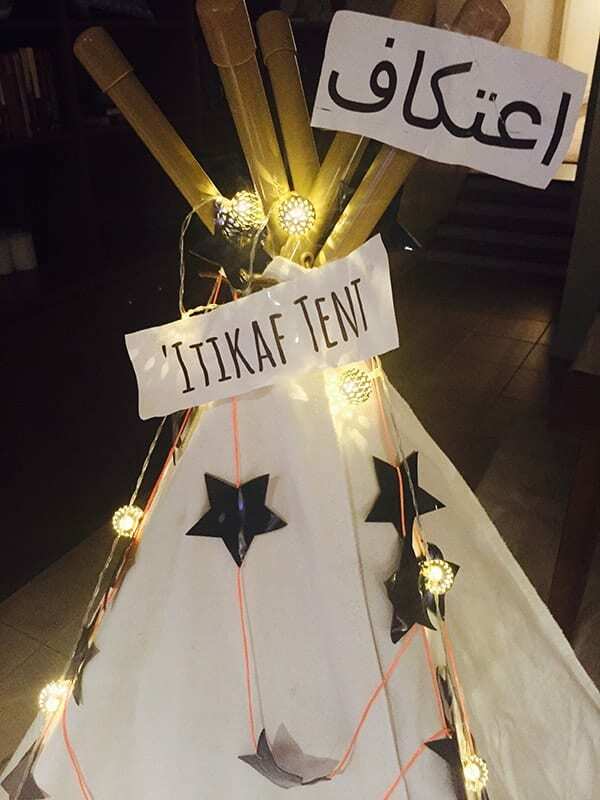 They were too young to do a proper i’tikaf in the masjid, so I purchased a tent and decorated it with fairy lights and stars on strings and left it in the living room for the whole month. I told them it was their own special place (no grown-ups allowed!) for thinking and dreaming and praying in Ramadan. Inside, I placed child-sized prayer mats, prayer beads, mushafs on stands, picture books about Ramadan and the prophets, Qur’anic stories for children, and their Ramadan notebooks. They could go in and out of the tent whenever they wanted, but it wasn’t a place for playing Angry Birds on the iPad! I wanted them to get used to the idea of a place of retreat that was only for their time with Allah , even if they just laid on their backs and daydreamed about life and the universe while they were there. There are many more amazing ideas available online for ways to make your Ramadan special for your kids (Pinterest is a great place to start). Choose what works for you and your family and makes you feel excited and happy; it should not feel like another burden or hassle in your life. Don’t feel overwhelmed, and keep in mind that teaching and sharing all these things with your children, with the right intention, is ibadah for you. Finally, remember that your children don’t care about crafty perfection in these things, but will care about the warm feelings you nurtured in them towards Ramadan and their faith. May your Ramadan be full of blessings, happiness and sakeenah. Ameen! Susan Carland recently submitted her PhD in Sociology at Monash University, and is the presenter of the upcoming ABC Radio National program “Assumptions”. She is the principal of the Bene Kids Madrassah and is married with two children.